SneakPeek Pro has been a huge time-saver for designers everywhere. We’re continuing that spirit with the completely revamped Quick Look enhancement for Creative Cloud and Creative Suite users. 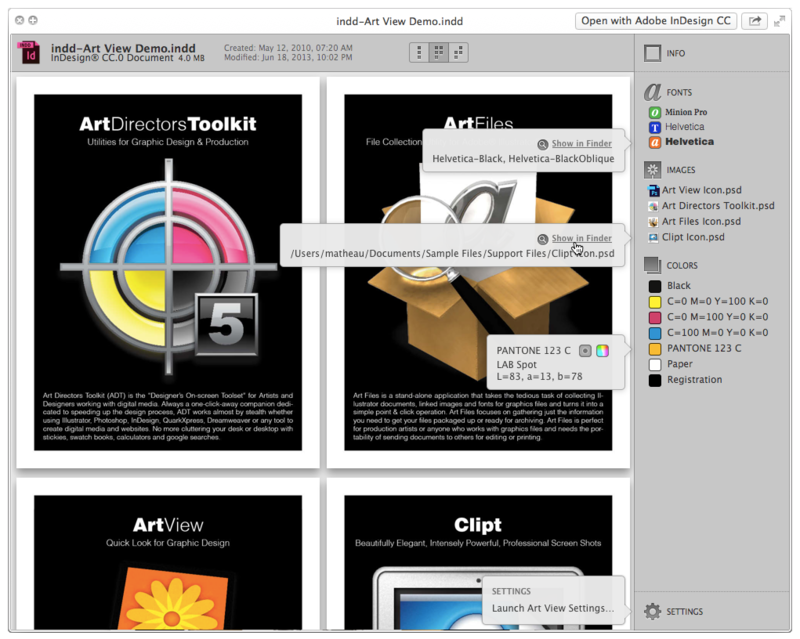 Art View sports a brand new interface and offers great new features like the ability to view spreads, reveal fonts and images in Finder and much more. If you’re a current SneakPeek Pro user and you’re not ready to make the move up to Art View, you can still download a fresh copy or visit our Downloads page. If you’d like to uninstall SneakPeek Pro, you can download our uninstaller here. If that does not work on your system or you’d like to uninstall it manually, read our blog post Uninstall SneakPeek Pro. Continued support for all Creative Suite and Creative Cloud. Reveals used Fonts in Finder. Shows multi-page documents with or without spreads. Compatibility with Mac OS X 10.9 Mavericks. Official support for Adobe Creative Suite (including CS6 v16) and Creative Cloud (v17).